After working fine, with no problems, for 28 hours and 38 minutes, the site started the whole UP/DOWN sequence again. With no warning the site went down at 3:40 pm, and it all started again. So now it’s back to Godaddy Tech Support once again. We did make a trip up to Spring this morning to meet up with some RV friends at the Potatoe Patch restaurant there. From the left: Debi Hurlburt, Sandy Mills, Judy Mott, Mike Mills, and David Evans. 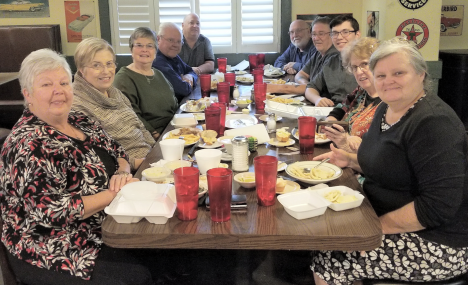 then coming around the back on the right: Me, Ed Hurlburt, Logan Mott (Judy’s grandson), my Jan, and David’s Jan.
Had a great time with old friends. Hopefully we can do it again soon.